This post has 5,582 views. A couple of weekends ago, some friends and I went to Niagara Falls and Buffalo. I have been to the great falls before, but that was a long time ago and also I have never been to the US side of the falls. It’s also summer where I have a little more time on my hands, so it was a good time to visit. As always, this post is a short account of the my trip along with some photos. Photo credits go to my roommate HL. The falls at night, lit up in a rainbow of colors. Buffalo is the second most populous city in New York state, and it’s about 15-20 minutes south of Niagara Falls. Among other things, Buffalo is the birthplace of the Buffalo Wing, which is pretty common bar food in the US and Canada. To be more precise, the Buffalo Wing originated from Anchor Bar, and so we went into Buffalo with trying the original Buffalo Wings in mind. Before having dinner though, we went for a walk through Buffalo’s downtown area. The downtown area was pretty empty during the Saturday afternoon. We walked to Niagara Square to check out Buffalo’s city hall and various other government buildings. We also looped around to Lafeyette Square and up Main St. where the light rail/metro service runs. 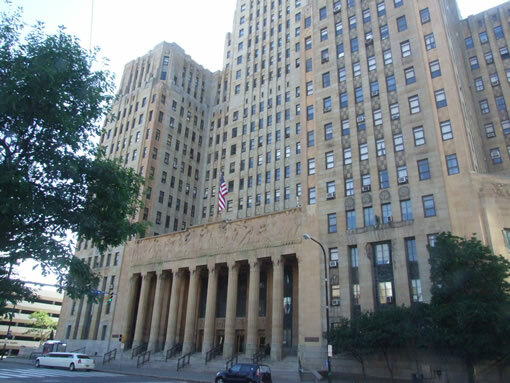 The Buffalo City Hall looks dated, but it’s a big building with character. 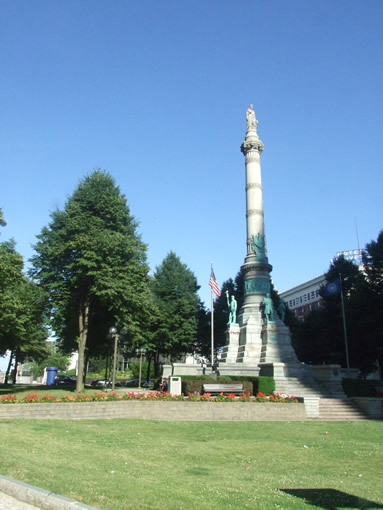 Lafayette Square park in Buffalo Downtown. As mentioned, we went to the Anchor Bar to try out the original Buffalo Wings. The three of us ordered a platter of 50 wings and we managed to eat 38 during the dinner sitting. I guess we won’t be winning any wing eating contests . The wings tasted pretty good, although I can’t say if it tasted any better than other decent Buffalo Wings I’ve had before. We had the hot wings and spicy barbecue, but neither flavor was that spicy by our standards. 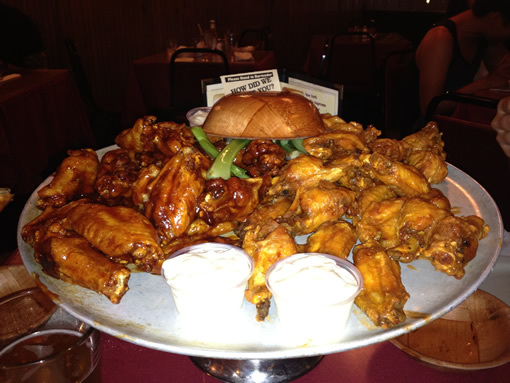 A platter of the Original Buffalo Wings from Anchor Bar in Buffalo. After dinner, we walked around for a bit in University at Buffalo’s south campus. 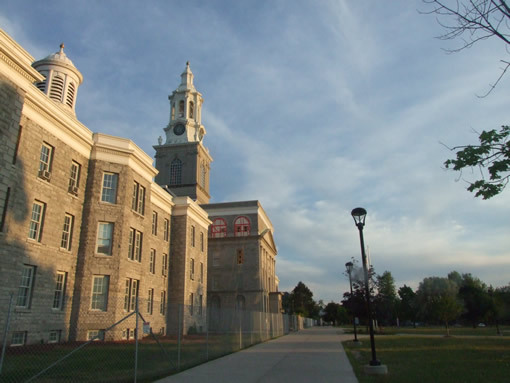 The University at Buffalo is the largest public university in New York State, and it has several campus areas. The north campus is the main campus while the south campus home to some of the schools. Next up we headed to our main destination, the Niagara Falls. We went to check out the falls at night, and there were a lot of people around which wasn’t surprising given that the falls are a world famous attraction. The Niagara Falls are of course magnificent monuments of nature, and they have the highest combined flow rate of any waterfall in the world. I have never been to the US side of the Niagara Falls, and it looked like the Canadian side is a bit more developed with a few large casino-hotels with observation towers. The Canadian side also has better view of the Horseshoe Falls and can see both the Horseshoe Falls and the American Falls together, but on the US side one can get really close to American Falls. 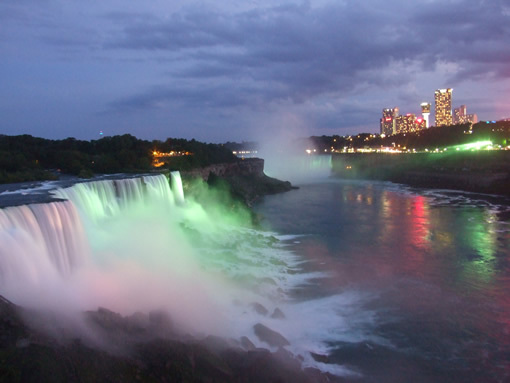 At night, multicolored spotlights are shined onto the falls, and the scenery is quite different than what it looks like during the day. The US side observation tower. Other than the viewing platform, the tower also houses the elevators to the Maid of the Mist boat tours. A Maid of the Mist boat returning from Horseshoe Falls. We started exploring the falls and the Niagara Falls State Park around the falls during the next day. We bought the Discovery Pass which provided reduced admissions to five attractions around the fall. At $33 dollars a person, the tickets were not expensive at all considering it includes five attractions. The first thing we went to was the Maid of Mist boat ride to the falls. 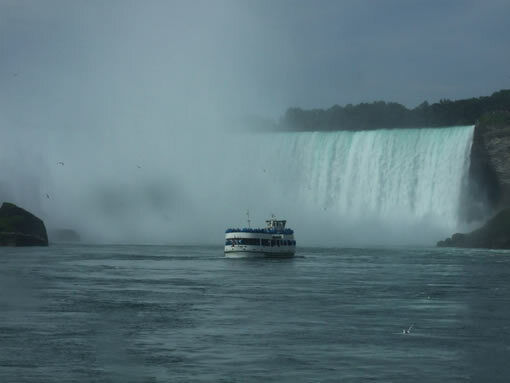 Despite having been to Niagara Falls more than once before, I’ve never taken the boat ride before and it was the attraction I was looking forward to the most. The boat ride was certainly worth the experience. The Maid of Mist launches from a dock at the base of the Observation Tower, and it goes by the American Falls and then stops for a bit right in front of massive Horseshoe Falls. On the boat, we can feel the power of the falls as the boat shakes and mist and water spray at us from all around. Thanks to the raincoats that were handed out, we didn’t get too wet, but that changed shortly after. The Cave of the Winds platforms are built right beside the Bridal Veil Falls. We took a few pictures around the Observation Tower before heading to Goat Island. Goat Island lies right between the American Falls (and the smaller Bridal Veil Falls) and the Horseshoe Falls, and this is where people go to visit the Cave of the Winds. Despite the name, there is actually no cave as the cave behind the American/Bridal Veil Falls had collapsed long ago. 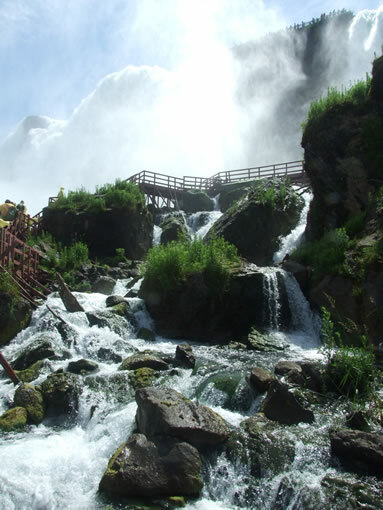 Instead the attraction consists of a series of wooden platforms built right next to the bottom of the Bridal Veil Falls. Part of the walkway get constantly sprayed on by the waterfall, and there are a few decks where the spray was very strong. I went to one of the heavy spray decks to get my photo taken and ended up getting wet because the air currents created by the falling water lifted up my raincoat. The Cave of the Winds was very fun, and being able to actually touch water from the falls was quite the experience. The Terrapin Point, literally a few feet away from the edge of the powerful Horseshoe Falls. After the Cave of the Winds, we walked around Goat Island some more. We stopped at Terrapin point which is right next to the Horseshoe Falls and provides some great views. 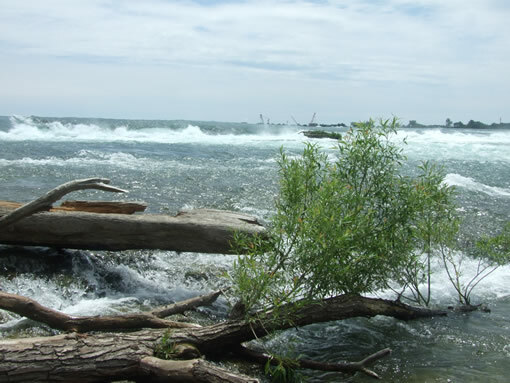 We then went to the Three Sisters Island, and on the outermost island people could step into the waters that are part of the Canadian Rapids feeding the Horseshoe Falls. At the outer edge of the outermost of the Three Sisters Islands, looking on into the Canadian Rapids. After walking around for so long, we took the scenic trolley back to the Visitor Center and went into town to have lunch. Afterwards, we went to the three remaining attractions on the Discovery Pass: the Niagara Aquarium, the Niagara Gorge Discovery Center and the Adventure Theater. These places weren’t that high on our priority list, but since we still had time, we might as well use the tickets we paid for. 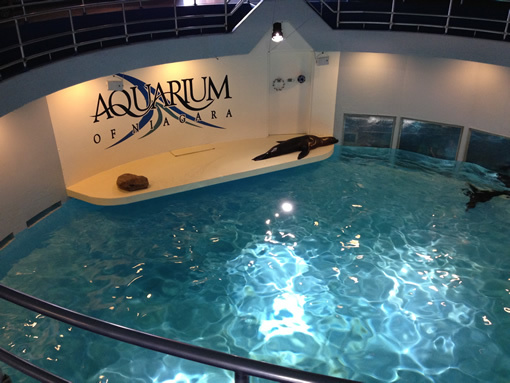 The central sea lion tank in the Niagara Aquarium. First we headed to the Niagara Aquarium. The aquarium was fairly small with one main floor of fish tank exhibits and a second floor with a few more small tanks. There is a seal pool, a sea lion performance pool in the middle of the building and there is a penguin tank, but that was about it. 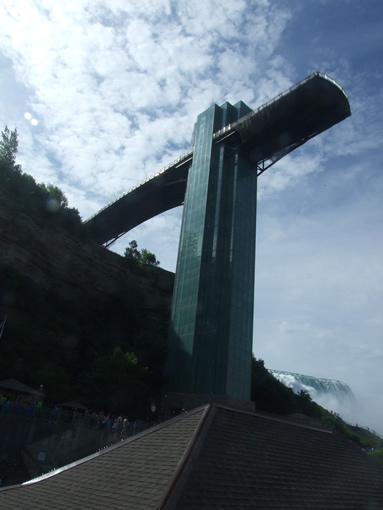 A pedestrian bridge leads from the aquarium to the Niagara Gorge Discovery Center. The center is more or less a small museum with exhibits on the history and geology of the Niagara Gorge. At the center we watched a short movie about the gorge and also took a simulated elevator ride down into the earth to learn about the various layers of rock lying beneath the surface. Finally, we headed back to the Visitor Center to watch the Adventure Theater movie. The visitor center doesn’t look big from outside, but in the lower floor there is actually a full-size IMAX theater. The movie was 40 minutes long and talks about some of the history of the falls, such as the Maid of Mist legend, and people who have survived going over the falls in a barrel or just by accident. 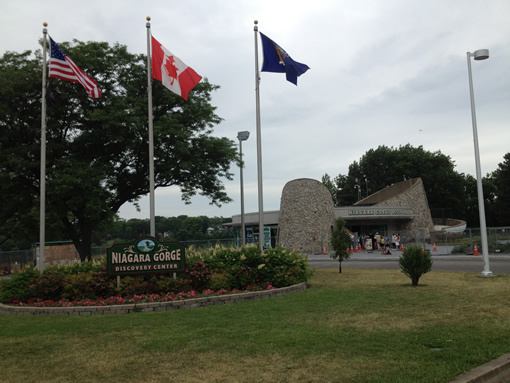 The Niagara Gorge Discovery Center, a small building but with some interesting exhibits. Our trip to the falls ended here and we headed back to our university town afterwards. I enjoyed the trip a lot. 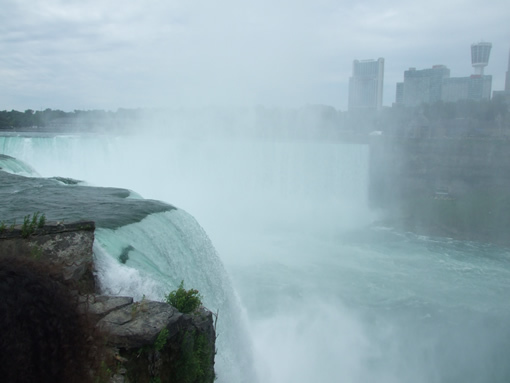 The US side of the Niagara Falls has plenty to see and do, and it was certainly worth the trip. Hopefully I’ll be able to go on a few more short trips over the summer.